Rolltec retractable awnings provide a whole other level of usability to your outdoor space. Whether they are protecting you from the sun, or providing cover during the rain, they give you the ability to increase your use of patios, decks and hot tubs. We wait all winter long for summer, only to be driven indoors by the brutal midday sun. 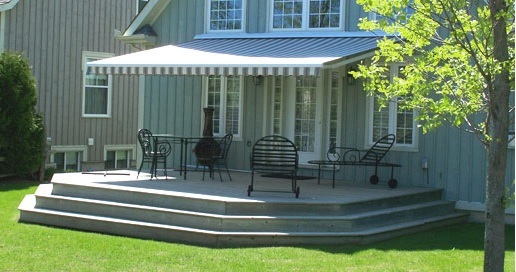 Enjoy the heat, the fresh outdoors and protect your skin from UV rays with awnings from "...the leading Canadian manufacturer of high quality upscale retractable awnings." Take a look at their full line of products, commercial and residential, then come in to arrange for your order and installation.